Franklin Barbecue in Austin, Texas is a place of legend. People wait in line for hours for brisket, ribs, and pulled pork sandwiches. And that line? It has its own Twitter account with more followers than most of us will ever have. Good news for San Franciscans, though. 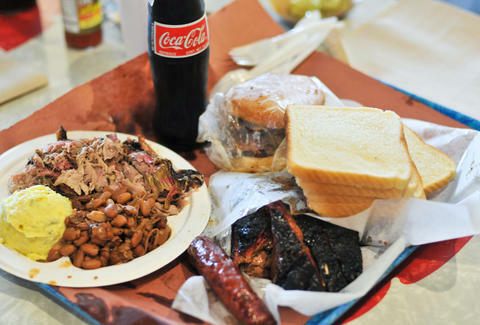 Now you can get a plate of Franklin Barbecue IN SF and WITHOUT the line. Franklin Barbecue's much-anticipated pop-up is finally coming to San Francisco on May 9th and 10th. That's how. Starting at 7pm, a group of BBQ fanatics will get to chill with Aaron Franklin and Jordan Mackay (Franklin's co-author of the new cookbook Franklin Barbecue: A Meat-Smoking Manifesto), eat a plate of slow-cooked meats (including Franklin's famous brisket) and a delicious dessert, drink two Magnolia beers, and take home a copy of the best-selling cookbook. This will all go down on the loading dock of Magnolia Brewery and Smokestack. Want in? Tickets will be available tomorrow on the Franklin Barbecue Eventbrite page starting at 9am. You can only get two tickets per person and, oh yeah, it'll cost you $130. Daisy Barringer is Thrillist's SF Editor and she's never waited three hours in line for anything in her entire life. She's super lazy like that. Follow her on Twitter @daisy.